3. What Version of Magento am I using? In this Magento 1.6 installation guide, we'll show you how to install Magento and get your store up and running in no time. Since Magento 1.6 is going to be manually installed without the use of a third party installer, there are quite a few steps, however, the installation process is quite easy. Before installing Magento 1.6, please note, you will need either a VPS hosting plan or a Dedicated hosting plan, due to the resources needed to run Magento. Please see our Magento Tutorials for further information on setting up your Magento 1.6 shopping cart. Now, using the cPanel File Manager upload the compressed package you just downloaded from the Magento website. Upload it in the same directory you wish to install Magento in. In our example we’re installing Magento in a subdomain called “magento.inmotiontesting.com” so we’re uploading the .zip file to the root folder for that subdomain. In File Manager, right-click on the .zip file and extract the file to the current location. This will create a folder called “magento”. We need to move the contents of the “magento” folder to the parent folder above. If we do not do this step our store will install in the “magento.inmotiontesting.com/magento” location instead of “magento.inmotiontesting.com”. Open the Magento folder, and “select all” files and folders. 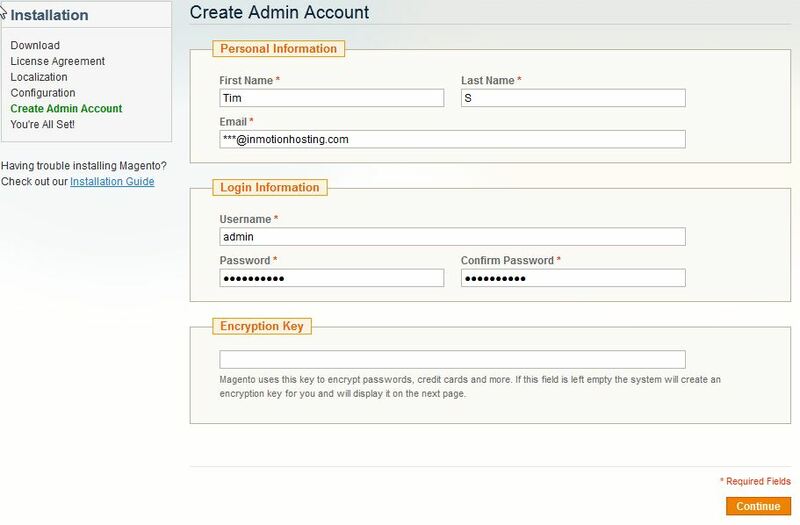 Fill in your database credentials that you wrote down from the first step and click "Continue"
Fill in the Admin Account Details and Click "Continue"
On the next screen, Magento 1.6 will provide you with an encryption key. Copy the key down and store it in a safe place. At this point, you've initially installed and configured your new Magento shopping cart. You can visit your website frontend or backend (commonly refferred to as the admin dashboard). I installed Magento2 on subdomain. The installation stack in 71%. The reson is apache2 default config. other case, .htaccess does not would. please inmotion, config for me on apache this, in order my magento2 work on my hosting. I checked all options on my local already. I stack now. I'm not quite sure what configuration you are looking for. Can you please reply back to provide more details or any errors that you are seeing? I have installed magento 1.9.x through the softaculus. But I can not access the admin, although the password and the username are correct. What can happen? If you navigate to Softaculous > All Installations, you can click on the pencil next to the installation you are experiencing login issues with. Under the Admin Account section, you can enter the admin username and password, to have Softaculous change this for you. Then test out the login with the new username and password you've entered. Also, you should be able to click on the icon of the person, under the Admin column on the All Installations page. This will log you into the dashboard automatically. I hope this helps! I installed Magento with Softalicious but I am getting an error that the Magento cron job is not running. I don't know how to solve this problem. Can you please help? If you have root access you can check if the cron job ran, otherwise Live Support can help you review the logs to determine if the cron job ran. You can check the cron configuration settings in the Magento dashboard. As a test try disabling mod_security in cPanel. i followed the procedure as it is ... but still when m opening my domain link... its just do nothing , magento installation its not asking for ... its giving me same thing that its hosted by miles web.. Thank you for contacting us. I recommend checking your account for any index files, such as: index.htm, or index.html (If these are there, they will load before the index.php of your magento site). Also, make sure your website is pointed to the correct server. If your problems persist, I recommend contacting your Host, so they can check your account for issues. yes there was an index file inside public_html. after doing some search, i transferred my magento files inside public_html and happily, the installation wizard came on type my domain but now i cant click on continue over there, even though all other links in that page are working.. Thank you for contacting us. I'm glad you were able to get the installation wizard to load. Can you provide a link to the site, so we can test it? my hosting provider have a one click install for magento. will that be ok to go with that? does that make a difference if i do it manually or not? Thank you for contacting us. Yes, it should be fine to use the "one click" installation. We recommend using our 1-click installation (Softaculous) whenever people are having trouble manually installing the software. I am also facing trouble its keep saying database connection error. I hosted all the files under public_html folder in the server. So i believe i don't need to change the .htaccess file, Please let me know what I am doing wrong. Please Note: I have created the database and user and assigned all the privileges to the user. Can you please provide your domain so we may look into the issue further? 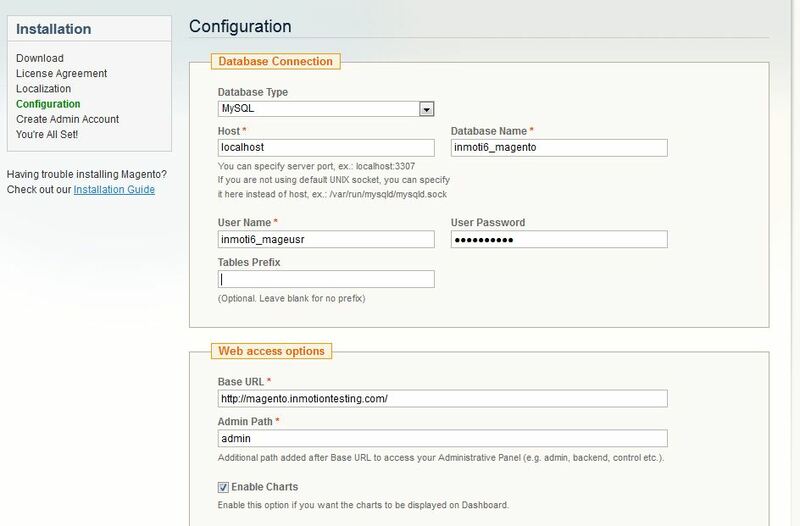 I am trying to install Magento to the hosting but it keep saying database error. I have creating SQL database and assigned a user with proper password as permentioned and i have given the previllages to the user also. Can you please provide your domain so we may look into the error. How did you install Magento? (via Softaculous or manually). 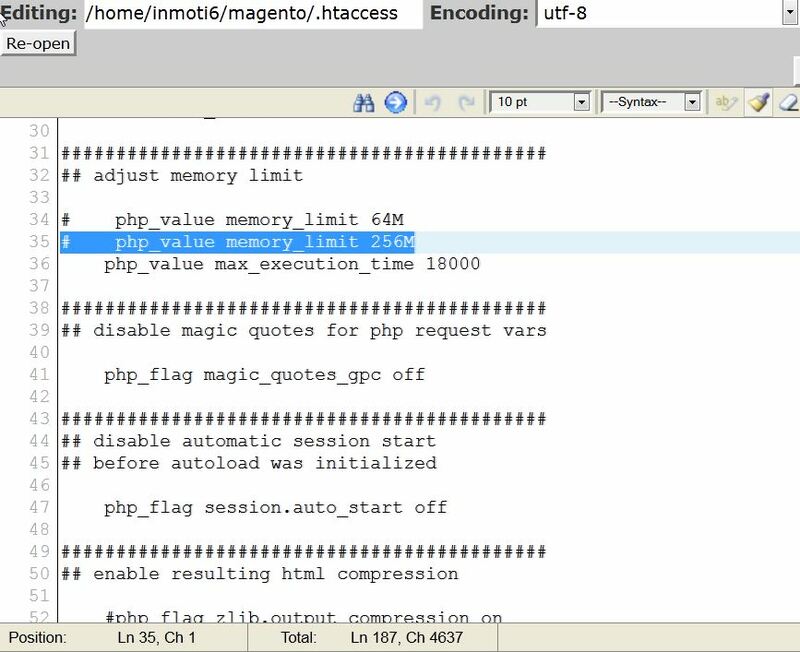 When Magento installs, it should also include a .htaccess file in its root folder. This file should have quite a bit of information in it. Also, there is another file named. # To set your custom php.ini, add the following line to this file:# suphp_configpath /home/yourusername/path/to/php.ini# php_value mbstring.func_overload 4 # Required for PWSB support. Please do not uncomment this line. When Magento installs, it should also include a .htaccess file in its root folder. This file should have quite a bit of information in it. Also, there is another file named .htaccess.sample with a copy of that base information. If you have that, simply replace the current .htaccess file code with the .htaccess.sample code. Then you should be able to see the code you need to alter in the instructions above.